One of the company’s most functional products, they are also an excellent dietary choice for anyone seeking healthy and balanced nutrition as they are whole grain, are low in fat and contain no added salt. They offer multiple benefits compared to a simple whole grain product, as the barley contained is richer in minerals and trace minerals, while the high fiber content helps digestion and increases body saturation levels, making them more filling. In conjunction with the absence of any salt, barley rusks can help reduce or control body weight. Barley is also a key ally in regulating blood pressure, lowering bad cholesterol (LDL), maintaining stable blood sugar levels, and the overall functioning of the body. Barley rusks with no added salt are particularly tasty, while the absence of any added salt gives the product an extra benefit: If we choose to accompany it with other ingredients, the absence of salt helps to promote and at the same time enhances the other flavors. 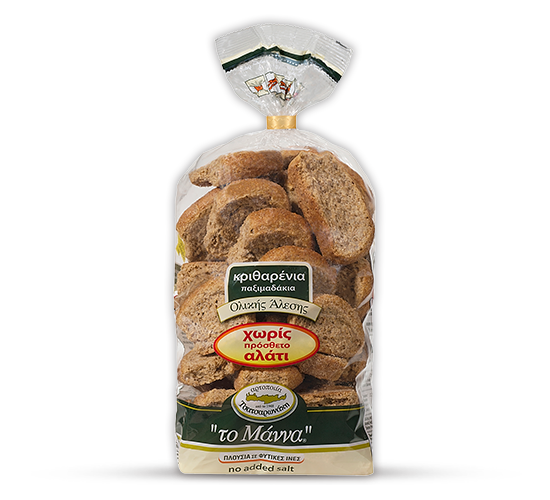 As a result, the delicate flavor of the rusks does not cover up the flavor of the other ingredients, but discretely enhance them.